Illustrations are sold upon request. Go to contact page to leave a message concerning illustrations. "African queen, wear your crown with pride." Style Description: Strictly african inspired evening dress with a head wrap. Style Description: Bustier- style wedding/ evening dress with blue rhinestones and a long trail at the back. Style Description: (Urban streetwear for women). 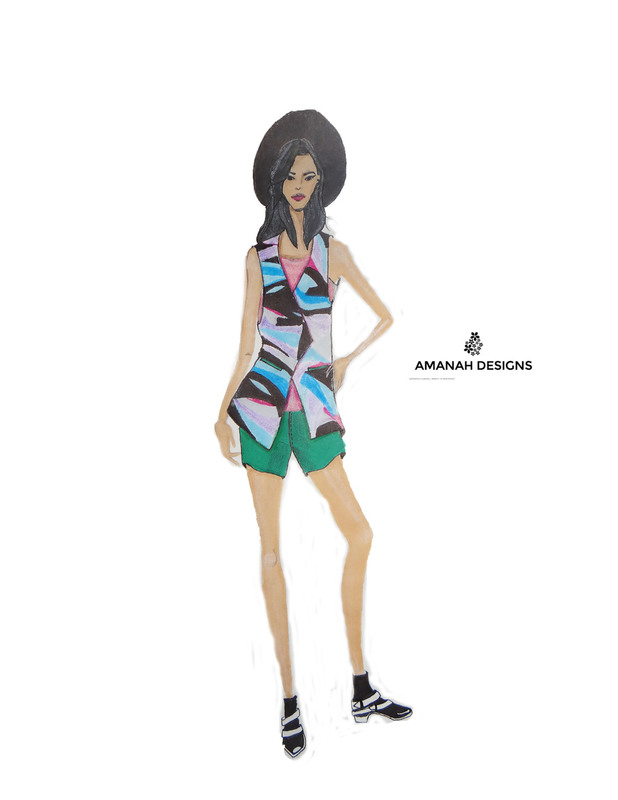 Casual shorts, printed vest with a pink chiffon blouse, a black hat and black boots. Style Description: (Urban streetwear for men) Denim blazer, white shirt with a mandarin collar, african printed shorts and loafers. Style Description: (Casual/ Official wear for men) Brown corduroy blazer, light chambray shirt, green slim- fit pants and black loafers. This collection consists of four different outfits made by the use of two denim fabrics. It displays a contrast in values of the color blue (light and dark shades). With these illustrations, I displayed diversity, not just in the styles of the outfits but also with the sketched personalities.